Brown meat - cook onions with meat - drain grease. Place meat and onions in large pan or crock pot. Add rest of ingredients. Cook slowly 4-5 hours covered. Remove bay leaves and garlic before serving. Serve on a bed of spaghetti and top with grated cheddar cheese. I also like to put onions on top. We also like it as a coney sauce for grilled hot dogs or you can just eat it in a bowl with crackers. This recipe comes from a new "friend" of mine and it's fantastic. I used the word "friend" in quotes because I've never actually met this friend in person but we've been chatting it up on facebook for about a month! Readers of the blog may remember my awesome new beach bag I got this year and the maker of that bag, 2 Moore Stitches, is the holder of this recipe! She tells me that she thinks the chili is actually better the next day. She also posted that she often makes a double batch of chili and freezes the leftovers. JJ is a big fan a Skyline Chili and used to eat it almost every night of the week when we first met. As of late, he doesn't eat it as often and when he does he usually subs out the chili for their rice and bean mixture as his topper for the noodles smothered in cheese. However, he's always up for me trying new recipes, so he was totally on board when I suggested having this for dinner one night. It probably came as a big surprised because I've just recently started to even like Skyline. He took me to Skyline on one of our first dates and I couldn't even finish one chili cheese coney, that's how much I didn't enjoy the taste of Skyline. 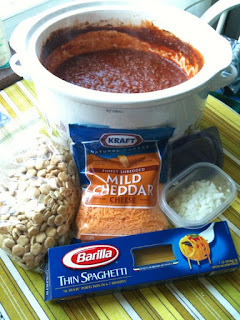 But about a year ago, I decided to give Cincinnati style chili another try and found that it wasn't so bad after all. With this chili recipe, I tried to crumble the meat up as small as I cook as I was browning it to get a very thin texture similar to the original Skyline chili. The only small change I made from the recipe above was using 1 tsp of minced garlic from the jar, other than that, I followed the directions above and it turned out great. I had a nice sized portion for my dinner and JJ ate 2 plates full, so clearly it was a hit at our house. So thanks 2 Moore Stitches for your Cincinnati Style Chili recipe, I think it will definitely become a staple in my recipe book for many years to come! Yesterday was an amazing day. I finished my first 6.2 mile run with a better time than I expected. The weather was wonderful, the energy was awesome, and all of that was shared with some great friends! We meet up in the dark hours of the morning, 5:30am to be exact, to car pool up to Dayton for the Air Force 10k run, which was at the Wright Patt Air Force Base. 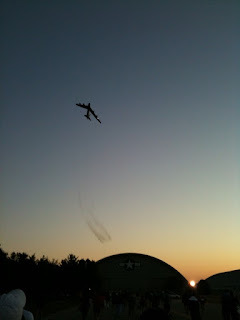 All morning long, huge military aircraft were flying over head, buzzing though the sky with such great force, giving me chills every time one flew overhead. I captured this shot right as the sun was starting to rise over the buildings on the base. Once we got through the traffic madness and made a pit stop at the porta john's, we headed to the starting line to take off for the 10k. 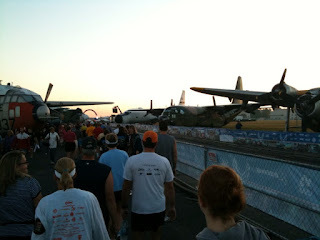 The picture below show the military planes that are all along the finish line for the races. During the run, I felt pretty good for the most part. There was a pretty big hill between mile 1 and 2 and our group agreed to power walk the hill, which helped us not be totally wiped out for the remaining 4 miles. We stayed with our 3 & 1 intervals of running and walking during the entire 6.2 miles. 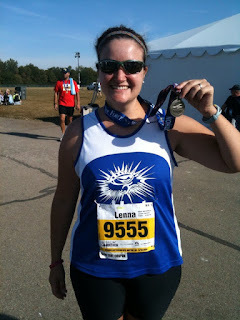 I did start to have some doubt around mile 4 about how strong of a finish I was going to be able to have. Mind over matter, that's a popular saying, right? That's what I had to do, I leaned on my friends, who were right there encouraging me along, and pushed though some of the mental doubt that was starting to creep up on me. Coming up to the finish line was such a great feeling. I knew that JJ and my parents were going to be in the crowd of people cheering everyone on as they finished and I couldn't wait to see them. As we turned the corner to head down the final stretch of the run, it was really emotional to see all those planes lining the way for us as we pounded our feet towards the finished line. About 100 yards out, I spotted JJ and my family and heard them shouting out my name, encouraging me as I crossed the finish line. As my running buddies and I crossed the finish line, we threw our hands up in the air and cheered out as all three of us had just completed our first 10k run. 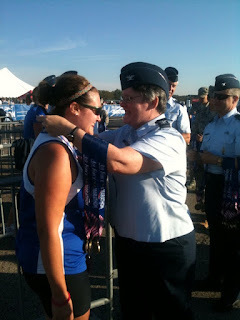 Right after finishing, we were presented with our medals by members of the Air Force, which was a pretty special moment. The numbers break down like this - my total time for 6.2 miles was 1:22:15. 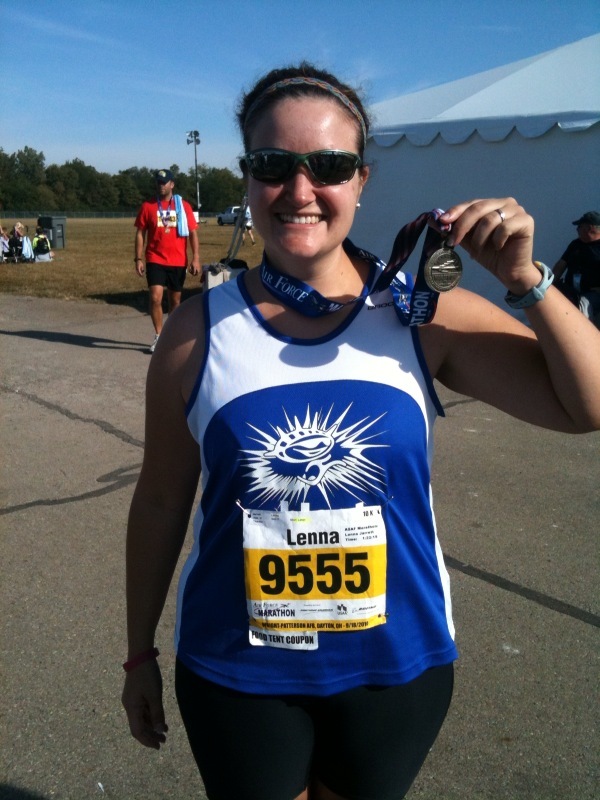 My goal was to finish in 1:30:00, so it was a great feeling to have beaten that time. My pace per mile was 13:26, which is good for me. 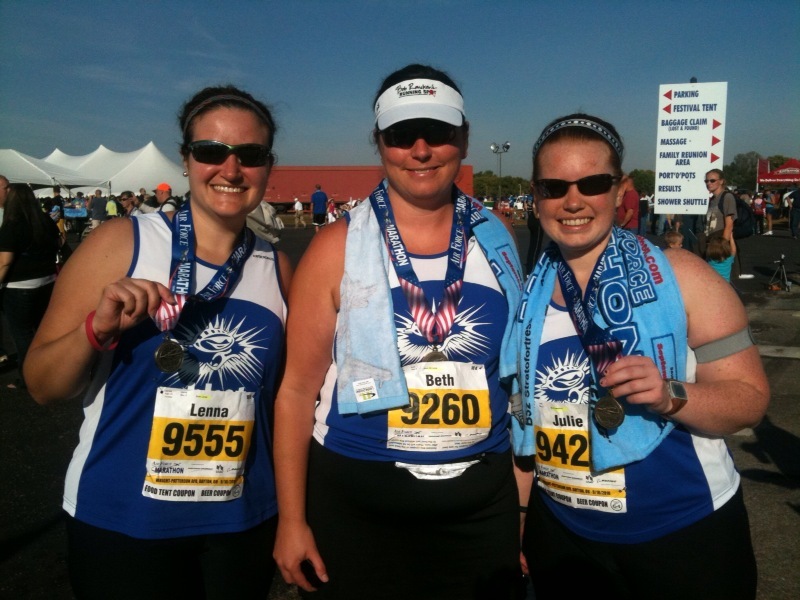 I finished number 1260 out of 1701 runners and in all female runners, I finished 641 out of 967. 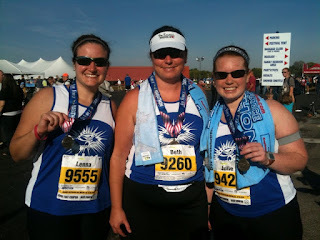 Thanks to my running girls - Beth and Julie - for pulling me through miles 4 & 5 and pushing me to the finish. A big thanks to JJ and my parents, who showed up and fought the traffic to make it to the finish line to watch me accomplish this big goal of completing my first 10k run. Having you guys there was really great and I am thankful for your support! Check out this video that JJ got of me and my running girls approaching the finish line for the Air Force 10k run - my first 6.2 mile run! 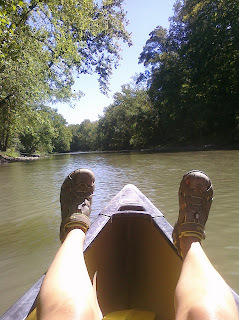 On Labor Day weekend, JJ and I took a little adventure and drove out to Morgan's Canoe Livery and enjoyed a 3 mile canoe ride along the Little Miami River. 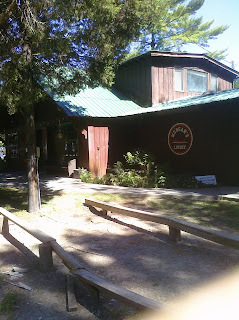 We went to their Fort Ancient shop, which is in the town of Oregonia, just about 30 miles northeast of Cincinnati. 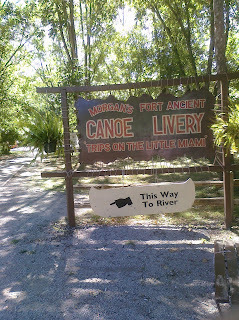 According to their website, the Morgan family built the livery in 1969 and "chose this secluded section of river for its natural beauty and protected isolation, as well as being the best canoeing section on the Little Miami." Laid back with my feet propped up while my awesome husband did all the paddling. Am I not the luckiest girl in the world, he's the best! Make 2 aluminum foil "boats" and place salmon fillets in center. Mix ingredients and poor over fish. Marinade salmon for about 30 minutes. 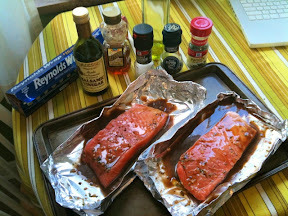 Grill salmon (in foil "boats") for about 10 minutes on medium heat. After 10 minutes, transfer fish directly in grill for 5-10 more minutes to finish cooking. (I recommend getting some non stick grill spray to use so the fillets don't stick to the grill - Weber makes a good spray option). Fish should easily flake with a fork when done. Serve with rice & veggies or over a Caesar salad! On a recent trip to Columbus, I made a stop at Sugardaddy's bakery. This spot was featured on the Food Network show "Throwdown with Bobby Flay" and ever since hearing about this store, I've wanted to check it out. Now, most who know of Bobby Flay would probably agree that he's not know for his confectioneries, but he was willing to take on the challenge of competing against the fine folks at Sugardaddy's for a "throw down" on who could make the best brownie. Now that's my kind of competition! Sugardaddy's is know for their "couture brownies", which is is a phase that has been trademarked by the owners. The shop in Columbus definitely has an upscale "couture" feel and is a fun place to check out. Here's some shots from inside their shop near the Polaris shopping center. 1 bag of "Pocket Change" - American Beauty brownie bites. Sugardaddy's cuts their brownies into circles, so they have tons of left over crusts. They've cleverly bagged up those left overs and sell them, which my new friend at the store tells me is the most economical option when purchasing their sweet treats. Cheesecake with Dark Citrus Brownie Crust - definitely check this option out if you're a fan of brownies and cheesecake (and who isn't a fan of those two things!). So, who won the "Throwdown" of Sugardaddy's vs. Bobby Flay? Go ahead, order some - you know you want too!